Don’t miss Luann Udell’s discussion on finding a balance…. Over a decade ago, we bought our first hot tub. It made New England winters soooooo much easier to bear. We immediately invited friends over to share the joy. We thought we were being so generous with our tub, and then we found we’d been a little too generous. After our first week of glorious steaming under the dark and starry winter skies, we discovered we’d given a dozen of our friends a whopping case of hot tub rash. Unfortunately, we had less-than-spectacular support and service from the company we bought the hot tub from. It turned out the “natural” ingredients to control for acidity and such, simply didn’t work very well. We eventually switched maintenance service and products to another company in town. We learned how to test our water samples, adding this chemical and that to maintain the right balance. With this procedure, we were finally able to keep our hot tub water clean, and healthy, and safe. Normally, I’d be too ashamed to admit this. But today the metaphors are just too spot-on to pass up. Wouldn’t it be wonderful if we could test our lives the same way? When things get toxic, or simply just smell “off”, you could pull out a little test strip and add the balancing elements you need to get back on your path. Not enough acidity? Are others are being caustic to you? Do others around you feel free to take “nibbles”? Maybe it’s time to get tougher, set stronger boundaries, and ask for what we need from those around us to restore the balance. This book, The Nibble Theory, changed my life, and it could change yours, too. Is the water cloudy? Are the treatments still not working? Maybe it’s time to look at your filtering system. Does it need to be cleaned or changed to make sure it’s scouring those bad influences out before they get recirculated back into your life? Check your take on life. 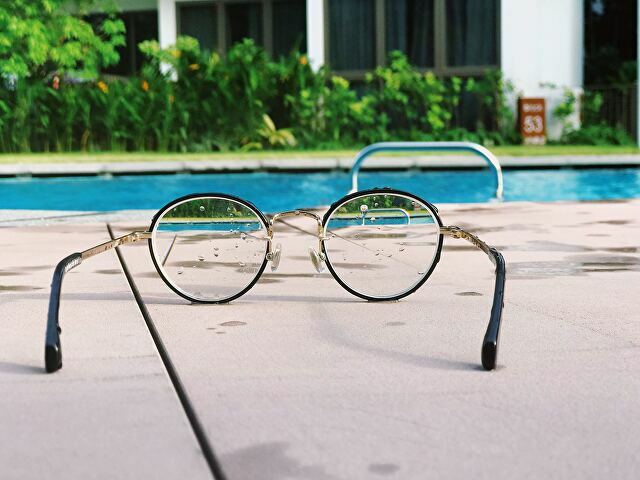 What color glasses are you looking at life through? And how do you handle the dreck that spills over into your life? Do you hold on to the bad stuff and setbacks in life, ruminating over them at night, accepting them as your “truth”? Or do you let go and flush it out? (Apologies, I did not mean to introduce a toilet metaphor…!) Check out This amazingly simple document for some insights and simple actions to start feeling better. Evidence of toxic infiltration? Sometimes toxic elements accumulate, and before we know it, we’re knocked completely off our path. Time for a shock treatment! Sometimes you need extreme measures to get those negative influences and toxic relationships out of your life. (Please do not resort to violence. It always ends badly.) Last year, I simply had to hunker down and be exquisitely kind and gentle with myself. It was surprisingly hard! But I think this is why I am now embracing the studio set-up. Every day brings a little more clarity about what I need to do. And nobody gives me grief about it. It’s all me! Is the balance still not right? Then you may have to empty the tub and start all over again. Maybe even try a whole new system to get the results you want. I’ve been meaning to get back to work in my new studio. But then I got carried away setting up my lighting. Which led me to search for more of my lighting stuff. Which led me to clearing a path in our garage so I could get to my old booth setup. Soon the entire afternoon was gone. I still haven’t made anything, and now I’m late with my article for FAV!! But I got rid of some stuff, cleaned some stuff, repaired some stuff, found some stuff I needed, and have more insight into what I need to do next. I’ve done that active listening thing for several friends in the last few weeks. My husband said, “So when is it YOUR turn?” I realize that process may indeed be a good water balance test strip. Er, life balance. A quick check in to see if I have the balance I need to make my art the best it can be. In lieu of little paper water testing strips, what can we use to measure what we need? A little group of artistic friends can help. Make sure they “have your back”, know your heart, and treat you fairly. Checking in with people you love and respect, who love and respect Y*O*U, can do wonders to get our balance back. I hope my columns help, and the wonderful conversations that have grown around them. I believe it helps to know we are not alone, no matter where we are on our life-and-art journey. Some find balance in family, pets (big and small! ), traveling, exercise, SHOPPING (oops! Did I say that out loud?? ), a class, a night out with friends, a great movie…almost anything can tilt that little testing strip toward the healthy medium we’re looking for. Whatever restores us to our best self, so we can get back to making our art. In fact, from what I’m hearing, most find that going to the studio and getting to work is the best strategy of all. For me, it’s all of the above. But mostly, the “aha” moments come from writing. It helps me untangle the knotty problems and worried thoughts in my buzzy brain. That’s another blessing with cleaning part of the garage today: I found all my old journals! And poetry I’d written years ago, much of which I’d forgotten about. I found beautiful letters from good friends and perfect strangers, people who had thanked me for the gift of a horse necklace, for reaching out, for having the courage to make a connection. It made me feel more “me”, if that makes sense. Because, I just realized (see? This is why I write!) each journal, each note-card, letter, poem, every small item I had set aside for my kids (their poetry, stories, drawings, etc.) brought back to me just how lovely my life has been, and how much love, joy, and connection my artwork, and my writing, have created, for myself, and for others. As I’ve said so many times, we tend to think of the times we “did it wrong”, the times we struggled with, the mean things people say, and the art project that didn’t quite work out. But my life test strip was there to tell me it’s all okay. In fact, it’s all really good. Time to see if it’s safe to go back in the water. The hot tub is long gone. When we sold our house to move to California, the new owners did not want it. We were able to sell it for half of what it cost us. My husband and the husband/dad part of the new family were there when the guy came to pick it up. (They had just moved to NH from the Midwest, and had never had a hot tub.) As the guy loaded it onto his truck, Jon said, “Man, I don’t know how we would have gotten through those last few winters without that hot tub!” And the new owner, confused, said, “You used it in the winter? !” (Jon said he could almost see the wheels turning in his head, and the guy looked a little regretful.) Oh well. P.S. And if you DO give your friends a hot tub rash, be sure to say you’re sorry. And take them out to dinner. Maybe even buy them a bottle of their favorite single-malt whiskey. Or two. Or three. LET ME COUNT THE WAYS: Why Didn’t That Gallery Take My Work?? Remember, gallery owners are just customers with stores. Years ago, I wrote an article listing all the reasons why a gallery might not accept your work. Well. Not all the reasons. Because I think more are being born every minute…. Why did I do this? Because at some point in our art career, when we approach a gallery, we will probably face rejection. And when that happens, we struggle to figure out why. 1. Your work isn’t up to snuff. 2. Your work is really good, but not their preferred medium. 3. Your work doesn’t fit in with their current inventory. 4. Your work looks too much like work in their current inventory. 5. Your work is overpriced. 7. Your work is fine, and well-priced, but will not appeal to their clientele. 8. They like your work, but they don’t like you. 9. They like you, but they don’t like your work. 10. They don’t like you or your work. 11. They can tell you don’t like them. 12. They’re having a really bad day. 13. You’re having a bad day, and it shows. 15. You are too meek when it comes to talking about your work. 16. You are too arrogant when it comes to talking about your work. 17. You try to establish your creds by dissing their other artists. 18. Your color palette is too dull. 19. Your color palette is too shocking. 20. You’re already in every other gallery in town. 21. You don’t have an established reputation, and they only take the same artists. 22. Your work is all over the map-not a cohesive body of work. 23. Your work is all the same-no variety. between. So you don’t have to do anything to grow and connect with an audience. 26. They aren’t doing well, and they may even be closing up shop soon. 27. They aren’t dealing with their artists honestly, and they know your partner is a lawyer. 28. Your work is controversial. 29. Your work is technically good, but has no soul. 30. They know nothing about your medium. 31. They hate your medium. 32. They love your medium, but they are only looking for X medium. 33. They love your medium, but they already carry too many works in it. 34. They love your medium, but they don’t love you. 35. They know your work is already carried by their biggest competitor. 36. They don’t take local artists. 37. They only carry local artists. 38. They used to carry your work because you used to be a local artist, and then you moved away, and all their customers want to know why they’re carrying an artist on the other side of the country. 39. Your work is too fragile-breaks easily, can’t be packed or shipped, etc. 40. Your work is too big. 41. Your work is too small, too easy to shoplift. 42. Your work is too hard to display-too big, too heavy, has lots of loose parts, etc. 43. Your work is too trendy. 44. Your work is passe. 45. Your work is craft, not “fine craft”. 46. Your work is fine craft, not art. 48. Are you sensing a pattern here? There are as many reasons why a gallery won’t take your work as there are stars in the sky. Or at least as many reasons as there are galleries. Do some of these reasons sound familiar? They should. Many of these reasons are the same reasons our potential customers don’t/won’t buy our work. We often imbue gallery owners/managers with more power than our customers. Every encounter with a gallery was a learning experience. I realized when someone seemed mean, it was more about them than me. My work may or may not be “good enough”, etc. But the bottom line was, it just wasn’t right for them, period. Am I offended when a visitor doesn’t buy my work? Or criticizes it? To the first, absolutely not. Not everyone is our customer. We all know that, and yet, it can still feel daunting. The latter, yes, it’s offensive. But again, someone who feels compelled to complain to me about my work is revealing more about who they are. I can choose to pick that up and carry that anger, that embarrassment. Or I can choose to let it go, and find my true “next” customer. These reasons are similar for group shows, too. A curator might want variety in every single piece in the show. In which case, if your work looks too much like what they’ve already accepted, they may not accept it. But if they are creating a cohesive show with light-colored contemporary pottery, and your work is pit-fired and dark-colored, you might not get in. I share these “reasons why” not to discourage you, but to encourage you. I want you to persevere with the work of your heart. I want you to make the work that only you can make. I want you to tell the story with your art that only you can tell. I want you to make the work that brings you joy, and creates a powerful place for you to be in the world. Not every person is our customer (yep, I’m saying it again!) and not every gallery is our gallery. Every minute we spend being angry, hurt, disenfranchised by someone else’s opinion of us, our work, our medium, is a minute wasted. I know that’s easy to say. Disappointment is the curse of all creatives. Books get rejected, Oscars are awarded to the “safe” choices, artists are passed over. I get it. Just remember that we are dealing with fellow human beings. Some are wise and loving and respectful and evolved. Others? Not so much. We all have our preferences, especially petty ones! Here’s my last example: When I approached my first gallery, a non-profit, there were two managers. One oversaw the fine craft area, the other the fine art area. Being a fiber artist, I approached the fine craft person with my wall hangings first. Well, this is certainly small enough to be a pin! I was baffled, but feeling too strong to feel threatened. It was obvious this person had issues, and I knew there was something about my work that threw them off. I thanked her and left with my work. A few months later, our town of Keene had its annual “art walk.” Participating business venues exhibited the work of local artists in their windows for a week. A very popular and fun event! A friend told me afterwards that a very well-known (okay, famous!) artist, who was a friend of hers, saw my work while they were perusing the event. He stopped in his tracks when he saw my work. He said something amazing I can’t remember (more on this later), something to the effect that he loved it, it was fresh, it was different, it was unique, it was powerful, and it was beautiful. Cut to a couple years later. My fiber work had appeared in several exhibitions at the same facility, and the art manager asked me to become one of their permanent exhibitors. I told her politely I was there by invitation, but appreciated her enthusiasm. And kept walking to the art manager’s office. No, my work wasn’t significantly different-same style, same techniques, same colorways, same artifacts. The only difference was, I believe, my work was becoming better known. If we let this dominate our lives, if we pay too much attention to those who would take us down, we will let them–help them–crush our spirit. Try not to agonize about the gallery that didn’t work out. Try not to take it personally when someone else wins that prize. Let go of the people who don’t appreciate our art, or our medium, or our subject matter, or anything else people gritch about. Yes, it’s good to keep in mind we can always do better with our artwork. Our art biz has an arc similar to life. As we know better, we strive to do better, and be better. It’s the same with our art. Take all the energy generated by disappointment and failure, and channel it right back into the work of your heart. And I hope, someday, you, too, get a chance to prove your detractors dead wrong! You can subscribe to the Fine Art Views newsletter here. Author Luann UdellPosted on March 2, 2019 Categories criticism, gallery representation, mental attitude, What is the story only you can tell?Tags art marketing, customers with stores, how do I get into a good art gallery?, how not to get into a good gallery, how to deal with rejection, why didn't that gallery take my work?12 Comments on LET ME COUNT THE WAYS: Why Didn’t That Gallery Take My Work?? Sometimes a “major change” is simply many tiny changes in outlook. I have to admit, simply HOLDING something I’ve created is often enough to reconnect me. For everyone who wrote me asking why I’m walking away from my art and writing, let me reassure you, I’m not!!!!! a point of a curve at which a change in the direction of curvature occurs. (in business) a time of significant change in a situation; a turning point. That’s what it feels like. A “change” is coming, but I don’t know what it is. What I do know is, my story hasn’t changed. I’m not done telling that story! And so my art itself, and my propensity for writing about my art (and what I’ve learned from making it), will not change. I got lost in trying to pinpoint what was going to change. Stuck in trying to figure that out, because sitting with that has been hard. I had fallen so low in my self-esteem in this flux state that I broke my own rule about giving away my work. I don’t give my work away to people who expect it to be free, or those who demand I give it to them. Such a simple rule, and I broke it. To the tune of agreeing to do free work worth thousands of dollars. And to be grateful to the person who said I should do it. No worries, I walked it back! I’m only out $200, and I consider that a lesson I will never have to learn again. I hope! So I made a few more bad decisions. But I also made some very, very good decisions. Like reaching out to family, good friends, old friends, new friends, readers, supporters. I reached out, and found people who listened, deeply. They walked me back from the next bad decisions I’d made. And although I’ve been in a deep funk about who I am, they’ve been holding the memory of who I am, when I’m at my best. And even better, they shared how much they love and respect me even when I’m at my worst. Which gets me to where I am today: Tiny steps forward, and for the first time in months (many months! ), holding a tiny bit of hope. How I got there in a few hours yesterday is what I want to share with you today. It’s called The Science of Well-Being, a class based on brain science and scientific evidence, developed and taught by Laurie Santos. It’s been in the news since the course wen’t online in March. It’s quickly become Yale’s most popular course. The short story is, we don’t really know what we want. We don’t really know what will make us happy. And if we don’t understand what really will, or won’t, make us happy, then our pursuits in life won’t result in happiness. The first video talked about “A ‘Good’ Job”. When you ask people what they want from a job, it’s often things like “a big salary” and “opportunities to advance”, and “prestige”, etc. But it turns out those can be misleading goals that don’t necessarily make us happy in the long run. Yes, a livable income is important. But not at the expense of other goals that will actually improve how we feel about life. Like work that appeals to our strengths and values, work that challenges us in a good way, work that provides us opportunities to be “in the zone” or what is now called a “flow” state. So how do we do that? How do we identify those unique strengths, our important values? How do we learn to nurture them those strengths and values? Because doing so will nurture us, will increase our sense of well-being and happiness. This isn’t the old 90’s thing about “follow your bliss and the money will follow.” It’s more evidence-based, and doable. This class shows what works, and how to do it right. After a few hours of work yesterday, I read something that gave me a glimmer of hope that I, too, can figure this out. One evaluation survey showed that after taking the course, and implementing the (very simple) exercises, almost every student showed an average 30% increase in their sense of happiness. That’s nice. On average, every single student also reported a 70% DECREASE in depression. So “being happier” was something I’m always a little suspicious of. And I already know some of the more obvious, popluar goals, like “make more money”, won’t fix everything–especially if I sacrifice integrity and what makes my work powerful. I know fame and celebrity can be a shadow goal, and potentially a self-destructive pursuit. But the promise I could be less unhappy? Significantly less unhappy?? Bring it on! That tiny ray of hope, the realization that things really could be better, inside, with a shift in perspective, was enough to raise my spirits. And the way that happens–aligning key character traits and values with my life mission–is already giving me a wee bit of clarity of what that “inflection point” might be. As always, I’ll keep you posted on my progress. And in the meantime, I hope you check out the course, especially if you are also struggling with what would really make you happy! This post was originally published May 30, 2004, on a now-defunct blog-hosting site. This slightly edited version is dedicated to Rhonda K. Hageman, who read it when it first appeared on DurableGoods/Radio Userland. Thank you, Rhonda!! A topic came up this week on a small private e-mail list I host. The list started as a way for artists to learn how to get their work in front of a larger audience than friends and family, by exploring ways to sell, publish and exhibit their artwork. Some have found the process daunting. Perhaps they had difficulties selling their work as it was, then started producing work they thought would sell better. Or well-meaning people made discouraging remarks or suggestions that just didn’t feel right. I’ve never advocated making anything just because you think it will sell. I realized from the get-go that this process will whisk you away from your core vision (making the work that is in you and pleases you) and sends you scuttling down the path of trying to please others. No can do, says this girl. The thing is, so many times, when I hear artists have decided not to explore ways to sell their work, it’s for all the wrong reasons. They don’t get enough money, they find the quality of the work degenerates, the sales are disappointing, and the whole process doesn’t make them feel very good, nor creative, nor successful. Part of the reason this happens is we misunderstand what selling our art can really mean. In fact, many people associate “selling art” as “selling out”. I have found the complete opposite is true when I sell my work. I make the most beautiful work I can envision. Someone else appreciates the work I have made. I tell them the story behind the work. A connection is made. An exchange is made—usually their money for my work (or, if you prefer, the fruit of their labor for the fruit of my labor.) Hopefully, both parties are pleased with the transaction. That’s all. That’s it. That’s what selling my art means to me. No value judgments, no demeaning transactions, no loss of my artistic vision, no selling out. Lately, though, I’ve come to see another dimension, just as rich (no pun intended) to this transaction. ..
And that is the power my art has on others even after the sales transaction. The last few weeks I’ve received half a dozen e-mails, postcards and letters from people who have bought my work, or seen it in a magazine, or read what I wrote on 9/11. Apparently, the impact of my work on their lives has continued long after I sold them the piece. And that is the magic of selling/exhibiting/publishing your work. Not just the excitement of being able to generate some cash flow, perhaps even a livable income (which is pretty darned exciting!) But seeing how what you create working from your heart, seeing it start its own journey of inspiring hope, creativity, and passion in others. That is something I did not expect when I started my journey of making my art accessible to a larger audience. It is something I could not predict nor control. It’s just another affirmation that I am doing the right thing and on my true path. So before you sell yourself—and your art—short (or decide not to sell at all), consider this: Selling your art can be a good thing. A very good thing. It is a process, and sometimes a long process. As the saying goes, “It took me twenty years to become an overnight success!” Most small business consultants say it takes at least five years for a business to get established. Most people only plan for a year or two at most. Many artists give up after one bad show or one dismal gallery experience. The secret to success with your art? Keep on making the work you are passionate about. Then look for its market. Ask for help, but don’t assume what someone else says about your work is automatically true. Experiment. Adjust. Tweak. Sometimes small changes in format, size or presentation can make huge differences. But these need not be fundamental changes in what your art is. You should still be able to work with total commitment to your inner voice. In fact, most of the time, when I see an artist or craftsperson who is not having much success, it’s because they’ve “dumbed down” their work, made it more cheaply, made it more mundane. They doubt their ability to astonish, so they set their sights lower. They end up aiming too low. Make your best work. Make sure as many people as possible see it. Because your heart and soul are not for sale. They can only be given, with love and joy. A lot has changed in my art through the years…..
…but a lot of things HAVEN’T changed! This is the very first blog post I wrote, on Sunday, December 1, 2002. And it’s still true today. Except Walt is gone now, may his gentle heart and fevered brain rest in peace. And if it gives YOUR fevered brain a little peace today, well, that’s good, too! I was going to write about a discussion with a friend about his dirty house. But when I picked up the Sunday magazine that comes with our local paper, I came across some amazing statements by Meryl Streep that caused me to bump the dump story. I wake up every morning with a sense of dread about how hopelessly inadequate I am to achieve my goals, and I go to bed every night ever mindful of….how does the Lord’s Prayer go? “We have done those things which we ought not to have done, and left undone the things we ought to have done.” Well, that sums up the beginning and end of my day quite well. It’s the hardest thing I’ve ever done in my life, spiritually. I simply stopped listening to the little voices that told me how how futile it all was. Note that I said I didn’t stop hearing the voices. I said I stopped listening to them. We often dream that when we figure everything out, when we realize our perfect vision for ourselves, everything else will fall into place, too. When we get the right job, when we meet the right life partner, when we get our dream home, when we find the perfect little black dress, (when we reach the perfect size for that little black dress!) the perfect lipstick, whatever, that we will finally silence those little voices that always tell us what is wrong. (Please note I’m not talking about the little voice telling you about real danger. I’m talking about that little voice that tells you you will never be good enough, fortunate enough, strong enough, talented enough, blah blah blah. The inner critic.) When we still hear that little voice, we may panic. Dang! It’s still there! Where did I go wrong?? Then I get up and do it anyway. Everything I have accomplished in the last five years–and it’s a lot!–I’ve done in spite of that little voice. I don’t pretend to say that I have deeper resources than other people, and I would never even pretend to say that all mental health can be achieved by just saying no to those voices. I am saying it is an act of will to act in spite of my voices, and I feel blessed to have found that out. I now realize there is no place I can get to where I will not hear them. But now I don’t let them stop me from getting where I want to go. They can whine all they want, I’m going there anyway. KB: And reinvent the wheel. There you have it. The article notes that Streep has been nominated for 12 Academy Awards, tying Katherine Hepburn’s record. She’s actually won two Oscars. And that her work ethic is legendary. And every time she takes on a new challenge, she hears the same little voices I do! I wonder what she says to her little voices…..? Yesterday I wrote about the one-minute meditation that can help soothe your monkey mind. First, let me clarify my two metaphors. I use ‘lizard brain’ a lot. And now I’m using ‘monkey mind’. Is there a difference? When someone else does it better than me, and my immediate reaction is, “Why them, and not me? ?” When I see someone else’s fabulous work, and my immediate reaction is, “My work’s just as good!” When someone else gets into that show/gets that award/has more sales/success/whatever-the-fear-flavor-of-the-day is, and I think, “My work’s better than theirs, why did they get it/in/that and not me? !” Grrrrrrrrrr!!!!! GRRRRRRRR!!!! “Why doesn’t that person like me?? Did I do something wrong? Maybe when I said blah she thought I meant blah. Should I have said blah? Should I ask her? ” “Why didn’t anyone buy this necklace?? Am I charging too much? ?” (Since I don’t even earn minimum wage, that is really scary!) “I can’t figure this out! What’s wrong with me?? Am I losing it? Will I end up in the streets? ?” Blah blah blah blah and more blah. Lizard brain and monkey brain are both scared, and angry. When threatened, lizard brain attacks ‘the other’. When threatened, monkey brain attacks me. Life is a pie. If I believe the pie is finite, then when someone else gets a piece of pie, that means there’s less for me. But if I believe the pie is infinite in size, then there’s enough pie for everyone. So what’s my mantra for monkey mind? Not sure yet. But I know having compassion for monkey mind (rather than berating it, because after all, it’s me) and giving it something to distract it (“Here, count my breathes with me!”) helps. I read something years ago that stays with me: “You are not that anxious voice in your head. You are the person listening.” This helps. What is your mantra for lizard and monkey? Share! It only takes a minute. Really. You have 60 seconds, don’t you? I still run out of energy early in the evening. So I go to bed early. And then the monkey mind takes over. After a few months of this, I wondered if California was really were we are supposed to be. Unfortunately, there’s no permanent cure for monkey mind. Like an appendix, it’s ancient self-preservation thingie that doesn’t serve us well in our modern world. But we can take tiny steps, daily, to soothe it. Tiny steps that slowly, but surely, get us back to our happy, productive, peaceful place in the world. For starters, I found this one-minute video online. One minute that helps you calm your monkey. Second, watch for what crosses my path. And then it hit me: I wasn’t ‘sitting with uncertainty’. I was struggling with it. Fighting it. Trying to sort it all out. And when I tried to sleep, it rolled over me like a giant wave, trying to take me out to sea. Sitting with uncertainty… There it was, right in front of me like a Pokemon Go critter. And now I look up at my desk, where a pile of little horses, bears, and otters are waiting to be turned into ‘worry stones’…. I thought I made these to expand my product line. Nope. I needed them for myself!